A significant share of travel activities historically has been booked offline and in-destination. But advance bookings are increasing as more activities become discoverable and bookable online, making pre-booking easier. In addition, many pre-trip activity bookers simply like having everything planned before they leave for their trip. 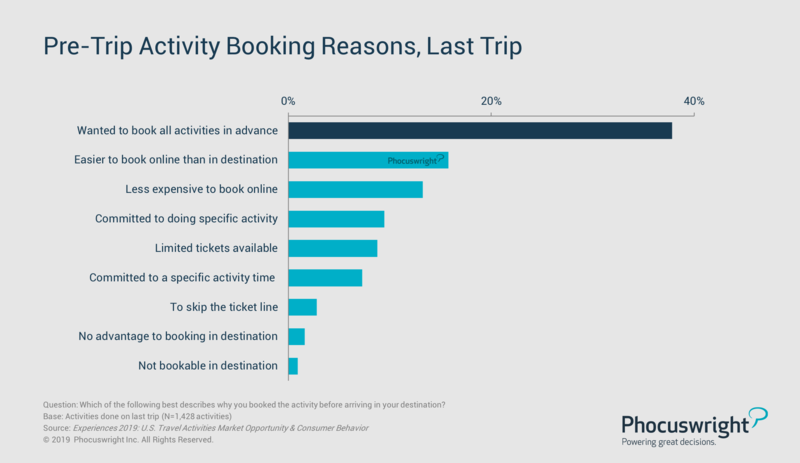 The top reason activities were booked before arriving in destination was because the traveler wanted to book all activities in advance (see figure below from Phocuswright's latest travel research report, Experiences 2019: U.S. Travel Activities Market Opportunity & Consumer Behavior). For more insights on the U.S. travel activities sector, with an examination of how U.S. consumers view and engage with activities, plus charting of the activity provider and seller marketplace, download the full research report here. Or subscribe to Open Access to unlock Phocuswright's extensive research library for your entire company. Explore how the explosive experiences segment is disrupting the traditional European tour operator market and creating new challenges in destination marketing at Phocuswright Europe. Phocuswright shares its latest research on the segment to kick things off, followed by a lively roundtable discussion with market players.